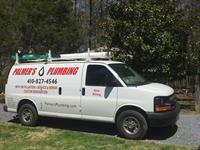 Palmer's Plumbing, LLC has an immediate opening for an Experienced Plumbing Technician. We are looking for career-minded individuals who are organized, detail-orientated and ready to join a hard working team! Our ideal applicant will be licensed as a Journeyman Plumber and will have experience with Plumbing Service and Repair. Strong written and verbal communication skills are required as well as a exception Customer Service. Applicant must have a clean background, be drug free and have a valid driver's license. Paid Holidays! Vacation/Sick/Personal Time! Company Health Insurance Plan! Competitive Pay! Overtime!